My love for Disney started when I was 6 months old and my parents took me to Disneyland. We went to Disneyworld numerous times when I was growing up and once I had kids I knew I had to share the magic with them. We said we would take them every 3 years but they ended up loving it as much as we did so we have been every year if not twice a year. One Thing I love to do is talk about Disney and all of the Magical Memories we have made. 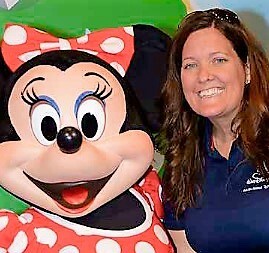 I would love to share my love of Disney with you and plan a magical vacation for you! As my kids have grown we have ventured out to Universal and have learned that the love for all Orlando theme parks grows every year for us. We just returned from Universal and already have our next trip planned. Adding onto the memories that I am building with my family we took our first family cruise this past April. To say we had a good time is an understatement. It was amazing and we have another family cruise planned for next year on Harmony of the Seas with Royal Caribbean. Please allow me to plan your Magical Vacation and start making those wonderful memories with your own family.